Below you'll find an image from the current movie Man of Steel, and below that, a photograph taken the day of the September 11, 2001 attacks on New York City. What was it about this scene that bothered me so deeply? 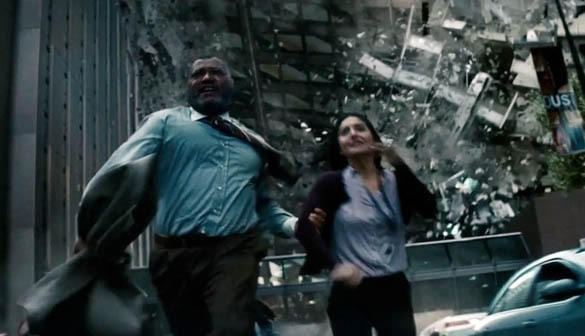 Whether intentionally or not, Man of Steel director Zack Snyder brought to the movies scenes of intense urban destruction that visually and viscerally trigger memories of a real-life event in my lifetime, in my city. The close similarity surprised and shocked me, as opposed to, say, movies I've seen where I expected the horrific imagery like World Trade Center or United 93. I'm not a huge fan of films of massive apocalypse. 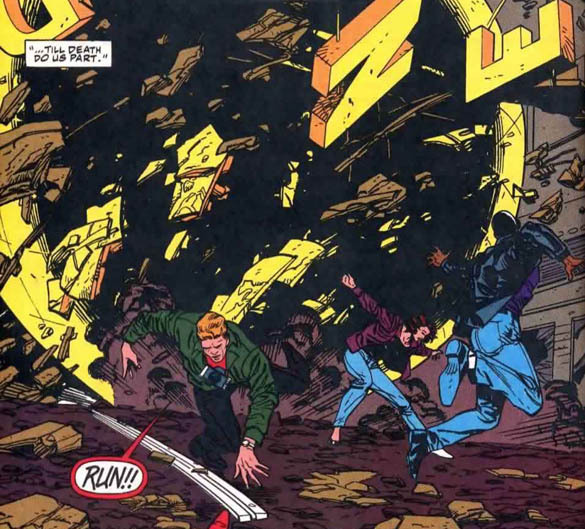 Armageddon's opening scenes of urban destruction disturbed me, but the movie turns into an extremely loud Michael Bay over-the-top-fest so quickly that it's hard to focus on the implications of the thousands of deaths caused by meteors striking major world cities. You could drawn the same implications from movies and other pop entertainment I generally enjoyed, like Independence Day. ...and thinking about that example helped me realize exactly why the scenes in Man of Steel bothered me so deeply. We have scenes in Avengers showing Captain America and an initially skeptical policeman actively working to evacuate the area and minimize civilian casualties. I have no doubt many people died in Avengers's Chitauri attack, but we have at the same time a feeling of hope: The Avengers are here. They'll protect us. They'll save us. I first realized the dread that apocalypse literature brings upon me when initially listening to the brilliant 1978 rock concept album Jeff Wayne's Musical Version of The War of the Worlds. It cranks up the despair inherent in the original story with the sad and sinister tracks "The Red Weed" and the madness in the songs of the Artilleryman and Parson Nathaniel. But it was perhaps this painted image from the book accompanying the album, and the spoken words of Richard Burton (and, on the wonderfully done 2012 version, Liam Neeson) that chilled me so thoroughly. Never before in the history of the world had such a mass of human beings moved and suffered together. This was no disciplined marchit was a stampedewithout order and without a goal, six million people unarmed and unprovisioned, driving headlong. It was the beginning of the rout of civilization, of the massacre of mankind. 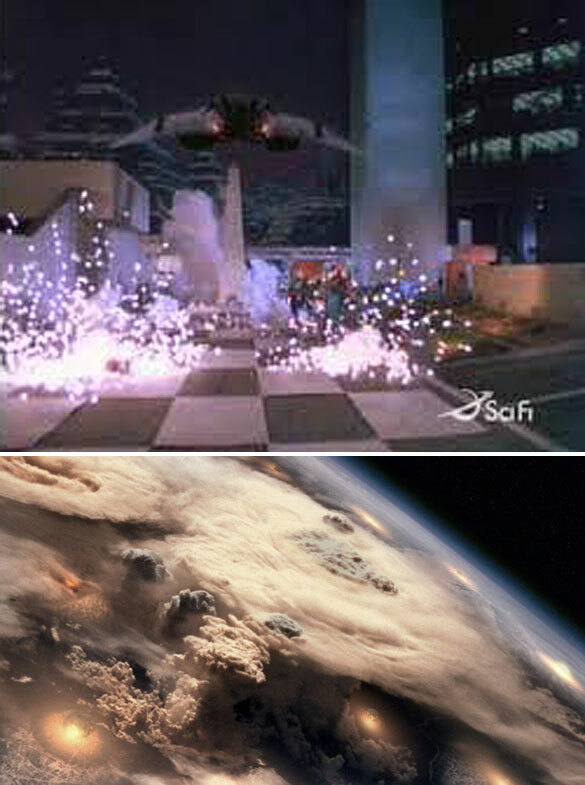 "The rout of humanity" that occurs in the 2003 reimagined version of Battlestar Galactica hit me harder than the original 1978 version: in '78 we see some Cylon fighters strafe running humans and destroy a large "PEACE" display, but by 2003 we're watching multiple nuclear bombs hit Caprica. The scale is huger, more immediately visceral, and ties into a basic human fear: not attack by sentient robots but atomic holocaust. And it's in considering the difference between the two Galacticas and between Avengers and Man of Steel that I've been able to put my hoof on what it was in the Superman movie that bothered me so deeply. 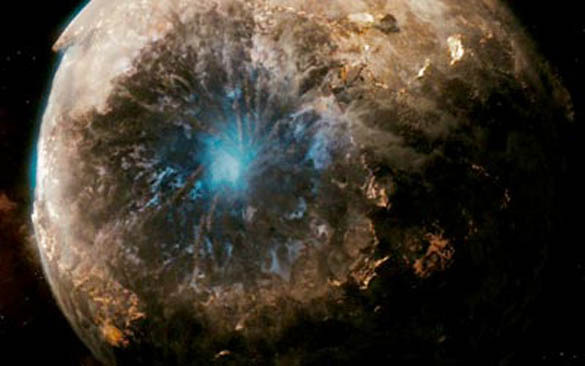 The 9/11 imagery alone isn't the full reason: it's the dark dread of despair and helplessness that we felt on September 11our very real fearsattached to something that's missing from the destruction of Metropolis in Man of Steel: hope. Because Superman is not present during the attack (he's on the exact opposite side of the world battling another Kryptonian threat), and rather than address the "Superman can't be everywhere all the time no matter how hard he tries" conundrum at the heart of 1978's Superman: The Movie, it just leaves us there. Superman shows up after the carnage is over. Thousand, maybe millions of people have already died. And Superman couldn't do a thing. 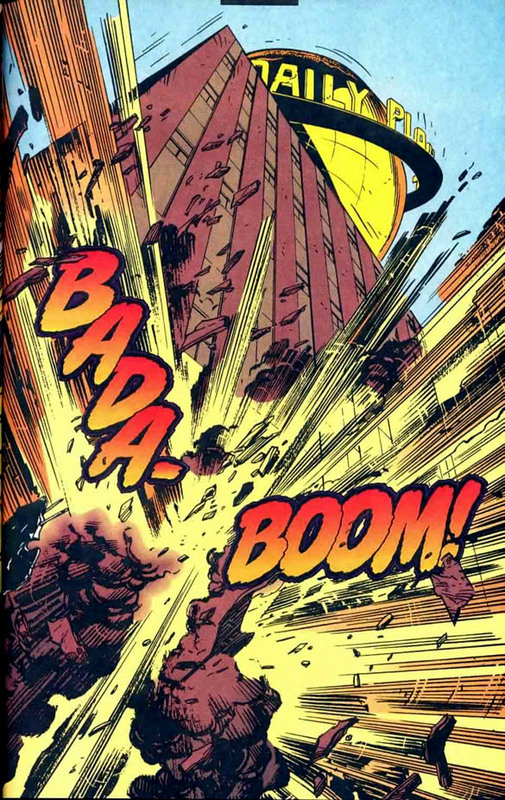 The emotions and reactions you get from reading a comic book filled with destruction and mayhem can't approach those of a live-action movie, but let's look for a moment at some scenes from Action Comics #700, the culmination of a storyline aptly called "The Fall of Metropolis." Like in the movie, Metropolis is destroyed. But the Man of Steel is there, helping to working to minimize the damage, to save the people. Because that's what Superman does. 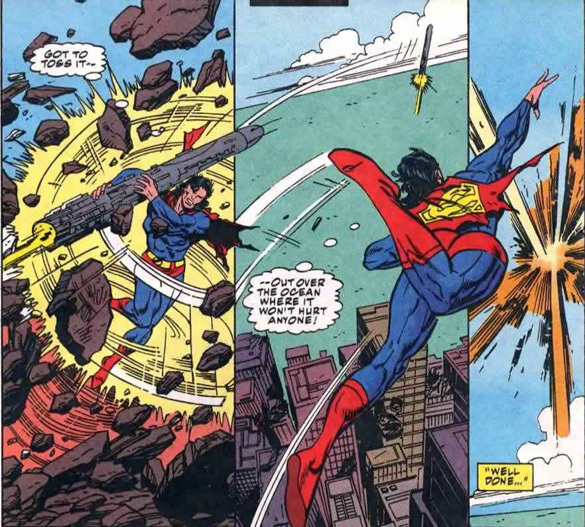 ...there's still the feeling that Superman made a difference on that level. He not only stopped the big baddie but he saved human life. 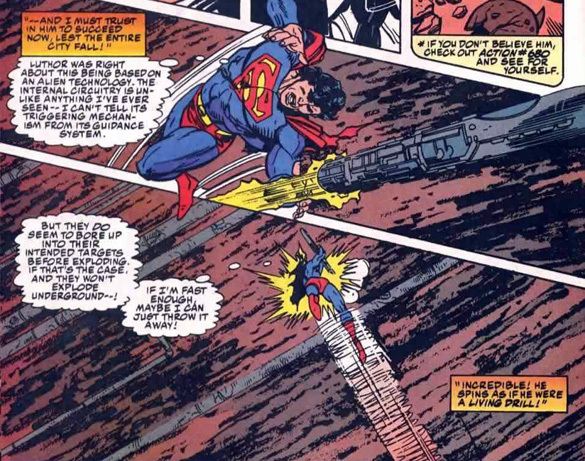 The movie's script stacks its deck against Superman: it doesn't give him a chance to do so. And I call shenanigans on that. Yes, of course Superman is going to fail sometimes. Yes, of course people will die under his watch. But a movie, working hard so to convince us that he's the best of the best and he'll protect us, that does not give Kal-El a chance, a scene, to do so...is not my Superman movie. 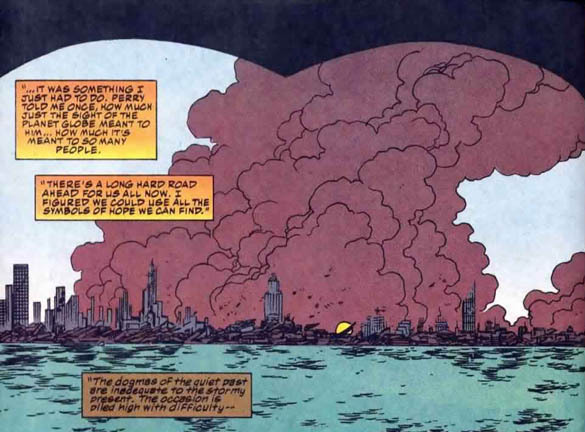 And the despair and fear of a scene that reminds me of 9/11, which doesn't give a chance of a blue and red-garbed man of tomorrow swooping down from the sky to help, misses the point of a Superman story. And that feeling of real life terror combined with the hopelessness of no aid from the movie's hero is what disturbed me, scared me, depressed me, and it broke my enjoyment. Look, I suppose I should say: your mileage may vary. Here's the truth: I enjoyed the film very much up until that point. The performances were solid, the special effects were amazing, it set up an interesting twist on the usual Lois/Clark relationship which hasn't been done before. I especially enjoyed the dichotomy between Jor-El and Jonathan Kent, which ensured that Kal's way to follow both their influences is to be Superman. But I think this movie will have a certain impact on those who were in New York on 9/11. 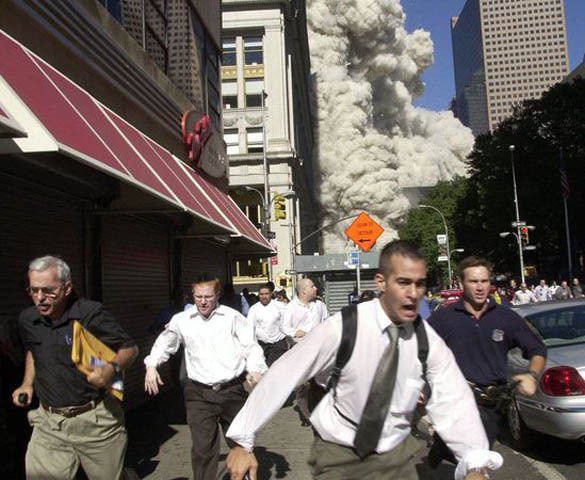 9/11 happened in my city in my lifetime, and there was no Superman to help. Something perilously close to 9/11 happened in this film, and the script didn't allow Superman to help. It's only this little stuffed bull's view, but that wasn't the Superman movie I wanted to see. ...and if you go this weekend to see Man of Steel, I do truly hope you enjoy it. 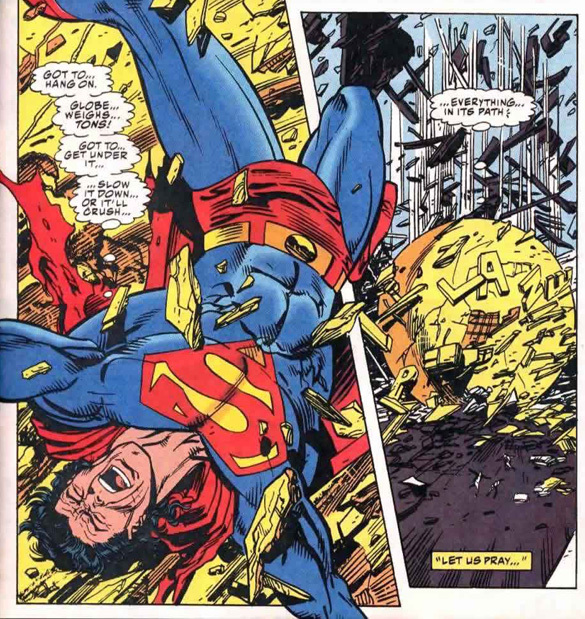 But for me, it reached so high, it had such promise, and yet so fully missed what a Superman story is. Yes, thanks so much for writing this. I suspect (and said so perhaps a month ago) that no one in Hollywood can write a Superman movie anymore, perhaps not for several decades now. I enjoyed The Man of Steel a great deal and intend to see the sequel. However, I'm with you in that this movie really isn't my kind of Superman story. good god man. got you. not exactly, but perilously close to what i felt. i'm not even new yorker, i live in medellín, colombia, and was around the terror era of pablo escobar. good god man. This is really beautiful and thoughtful. Thank you! I liked the movie for the most part. I'm sorry you were unable to enjoy it. Thank you for being so thoughtful and sharing your reaction. I felt the same exact way. 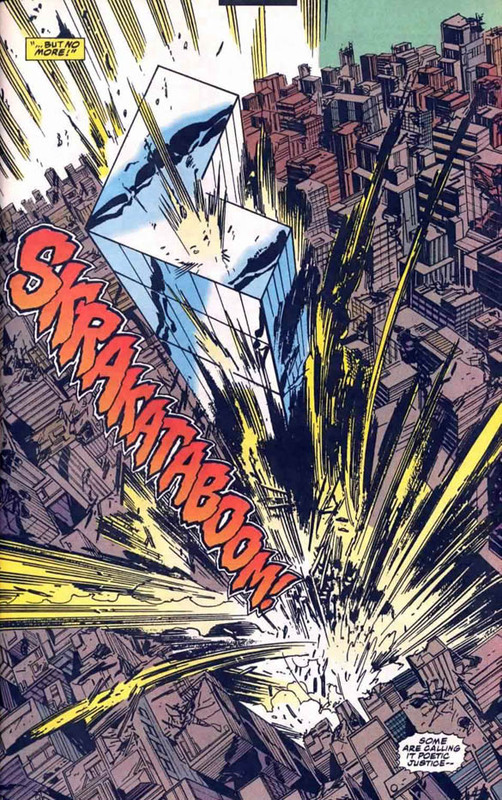 When those buildings were crumbling for no reason and Superman had to willfully ignore the screams of thousands, didn't he rethink the plan at all? When he was flying around metropolis, couldn't he sense all of the lifeless bodies that he knew he could have saved? What's the moral lesson, that he saves the entire world and has to compromise his own values to do so? Is that what Pa meant about the world being "ready" for someone who is willing to get their hands dirty through enacting justice? It's a totally dark, scary idea of an ubermensch whose judgment everyone has to trust implicitly. 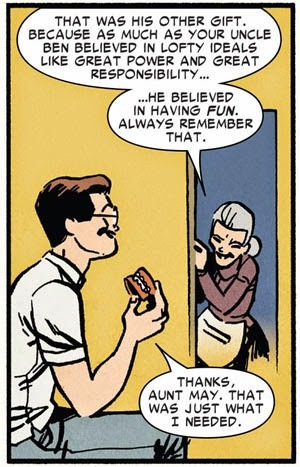 There's nothing benevolent about this superhero (myth), and instead of the worst of misplaced cynicism, we get even worse totally accurate and reasonable cynicism that most people (you, myself most of the time) can't deal with. 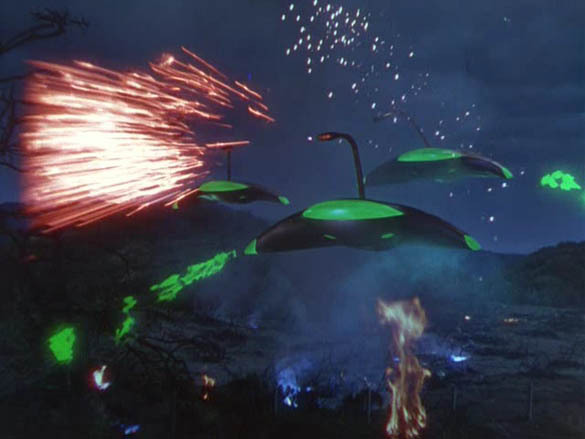 The Avengers lost me because of how sterile the invasion was. I enjoyed MoS much more because it wasn't sterile. I read you loud and clear, Bully. The wanton destruction made it almost impossible to enjoy the film. I liked much of the film up until the climactic battle scene and I feel tremendously conflicted over the thing as a whole. This film is so po-faced not even Bully can joke about it? We're doomed. Perhaps there's a post-credits scene where Manchester Black recruits Superman for the Elite? Bless you, Bully. You too, John. 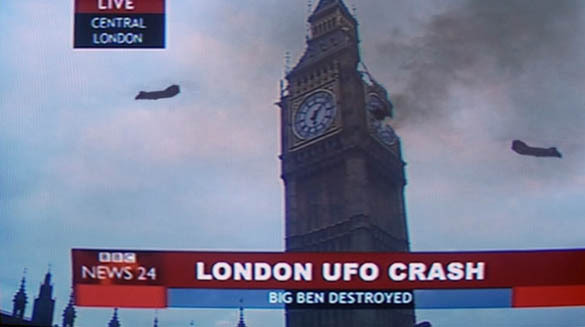 I thought I was alone in thinking that the destruction in the film mirrored 9/11 imagery a bit too much. It was enough to trigger a PTSD episode right there in the theater. Thankfully, my viewing companion was able to get me to look away. Thank you, Bully and John, for assuring me that I wasn't oversensitive about it. Long time reader, first time commenter. You've clearly articulated what made me so viscerally angry at this movie that I've been ranting up and down about how bad it is to all and sundry. Superman stories need hope. That's what he represents! Strength in the service of others, a protector and defender, the guy who runs into the fire instead of away from it. Sadly, Hollywood's overall tone of cynicism doesn't buy into hope, so all they can do is deconstruct the hero and leave nothing to fill the empty space left behind. Bless yer fuzzy little heart, Bully, you know what's up. Thanks for the well written article. Before I get into the meat of my comment I will say that the girl that was trapped is 'Jenny' Olson. Jimmy is now Jenny. I remember 9/11 very clearly even though I lived on the other side of the country. I never saw the towers but I've loved NYC each time I've had the chance to go out there and visit. Man of Steel left me feeling disgusted during those scenes. I thought the 'S' was supposed to stand for hope. I felt hopeless watching that. When I watched the Avengers I felt they they were doing everything in their power to protect people. 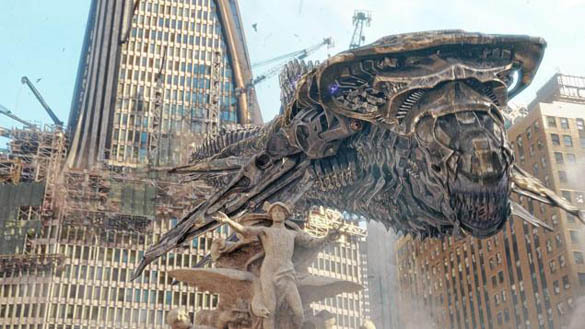 There was an interesting article about this over on IGN http://www.ign.com/articles/2013/06/18/what-would-man-of-steels-destruction-cost that puts the sickening destruction that they filmmakers were going for in perspective.